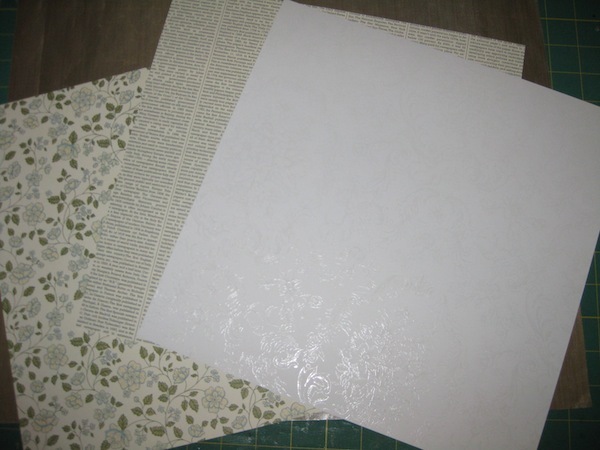 This is the specialty paper I was hunting for that caused the revamping of my craft room. 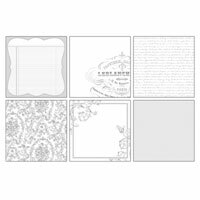 “Presto Patterns” by Stampin’ Up!. You can see (I hope) in the photo on the right, it looks like plain white paper. Up to the top right of the paper you will see some shiny writing. The entire page is covered with lines of writing. 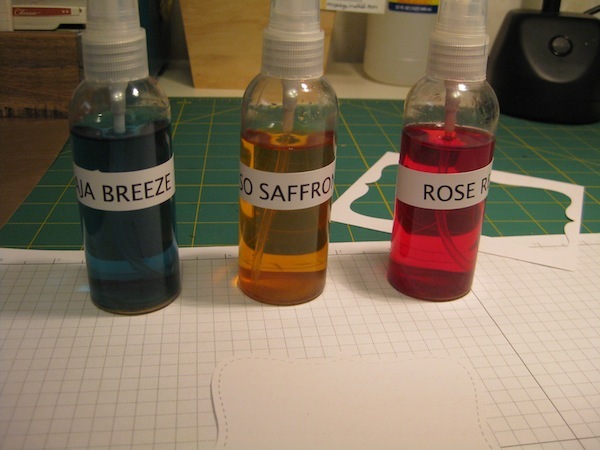 The experiment I did was to see if my “Home Made Stampin’ Glimmer Mists” would be the “WOW” I had envisioned they would be. I tried using Pearl Ex and hair spray. For some reason, this time, the “straw” thing got clogged up really bad on every bottle I tried it with. I did find success in “Perfect Pearls”. Water 2/3 of the bottle, 10 drops of Stampin’ Up! Refill Ink, and 1/8″ teaspoon of Perfect Pearls. These are Baja Breeze, So Saffron, and Rose Red with the Perfect Pearls. I used the Top Note Die from Stampin’ Up! 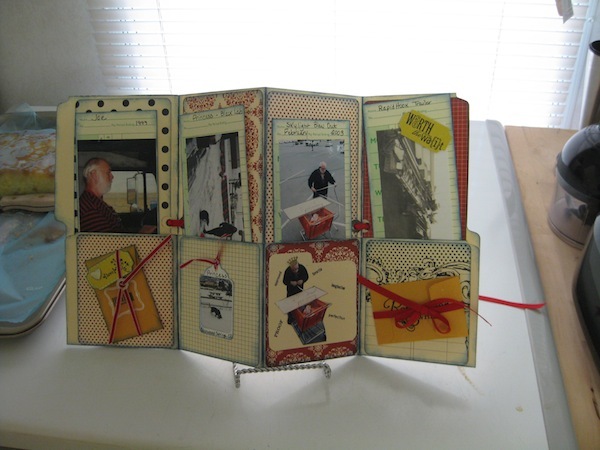 for the “Experimental Pieces” shown in this blog entry. The paper curled, as is usual, when it was wetted by the “Ink Mists” I’ll call them. Since I have a problem with my fabric cutting mat bubbling up when I use the heat tool, I purchased a couple of tiles from my local Home Improvement Center to do the heating on to save my cutting mat. I got two sizes. A 4×4 which was about 24 cents and a 6×6 which cost about 32 cents. I think the Inky Mists I chose were too light in color for this trial. There is not much color contrast to see the writing on the paper through the Inky Mists. The paper warped the other way and would not lay flat. I don’t know if it was because of the tile beneath holding the heat or if it is the paper. It is pretty, though. All sparkly. 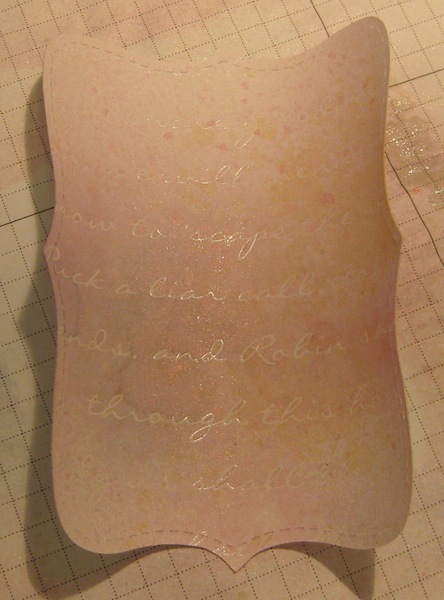 The shimmery stuff shows up, and the words on the paper peek out to be seen a bit better. The Inky Mist puddles show up, even after I used a kleenex to blot the excess moisture up before drying. I might have to break out my clothes iron and try to iron this flat. 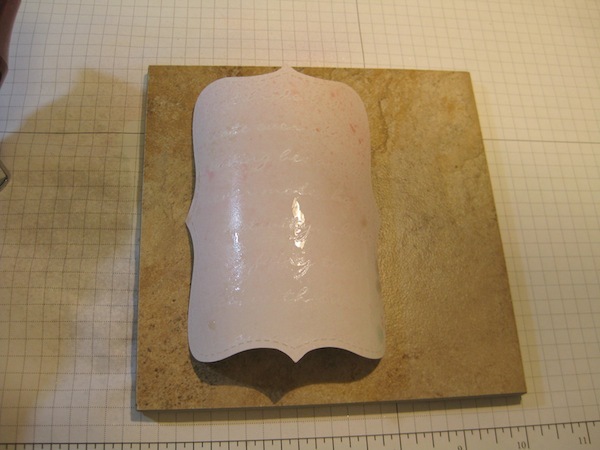 I was really surprised at the stiffness of this paper. 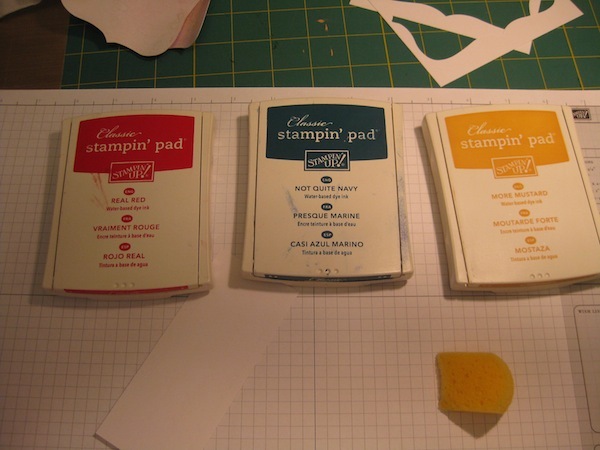 It is a thicker card stock than Stampin’ Up!’s Textured Card Stock. It is firmer also. Guess it is time to try a bit darker Inky Mists and see what happens. 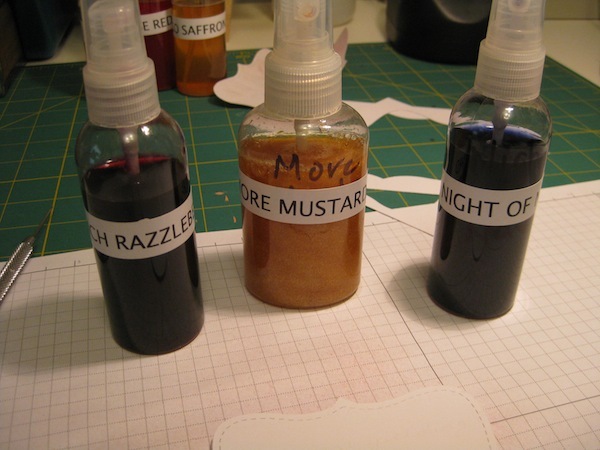 Rich Razzleberry, More Mustard and Night Of Navy were the Inky Mists I chose for this trial. It turned out quite a bit better than the earlier one. Deeper colors do show the words better on the paper. It even looks better with the deeper colors. Still warps after heating, but maybe there will be a way to tame it in my next experimenting. Time to bust out the Classic Inks and see what happens. I’m pretty sure the ink pads will do the trick as far as bringing out the words on the paper better. AND the paper won’t curl after the application of the Classic Inks as it did with the Inky Mists. One thing I forgot to mention. 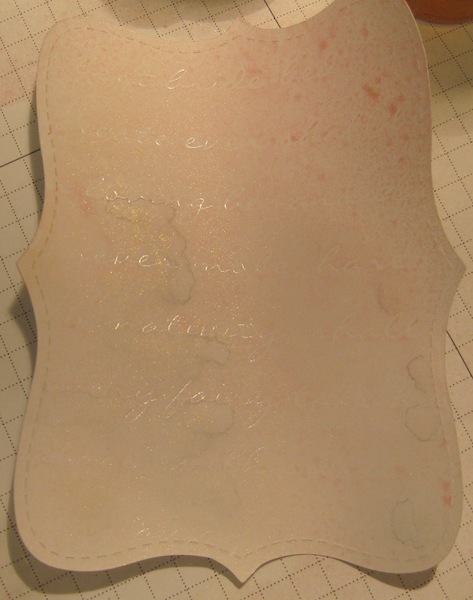 During the heating process and drying the Inky Mists, the embossed words on the paper melted flat. They didn’t puddle but it was like they just went flat. I could not feel the raised words as I had been able to previous to heating. This did, indeed, bring out the words embossed on the paper. I think I like this better because the words, themselves, are the sparkle on the paper. There are several different papers in the Presto Patterns package. 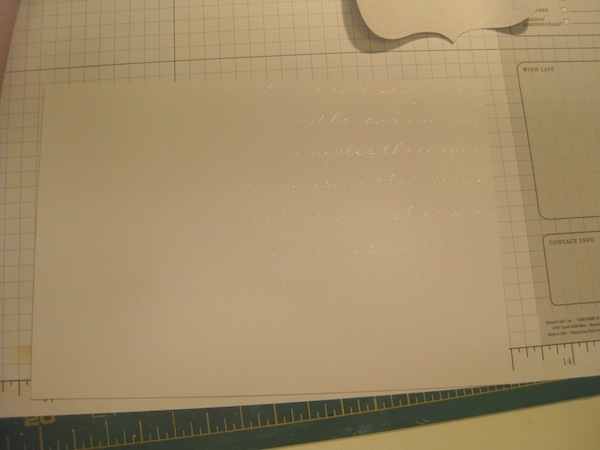 All of them are of this white embossed type of stuff on white heavy card stock. 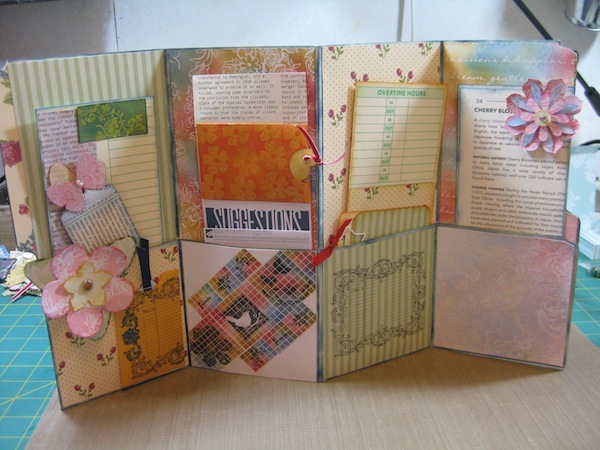 I have one more project to create for the January Clubs – Greeting Cards. The “Gift Central Club” item will be posted tomorrow. I worked on it and finished it yesterday. Trying to get Joe out on the road and I will have the neighbor children over for a few hours this morning. Play time will be later today. By the way….I’ve added a Poll to this blog. On the right, below the catalogs is a link to the Poll Question. I’d like to know what you think.